The Piracy & Armed Robbery Map below follows the definition of Piracy as laid down in Article 101 of the 1982 United Nations Convention on the Law of the Sea (UNCLOS) and Armed Robbery as laid down in Resolution A.1025 (26) adopted on 2 December 2009 at the 26th Assembly Session of the International Maritime Organisation (IMO). 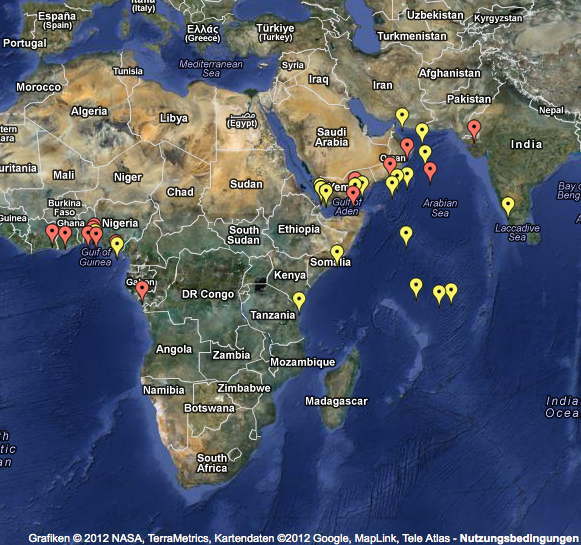 This map shows all the piracy and armed robbery incidents reported to the IMB Piracy Reporting Centre during 2012. If exact coordinates are not provided, estimated positions are shown based on information provided. Go to the ISS Web-Site to view more information of an individual attack.